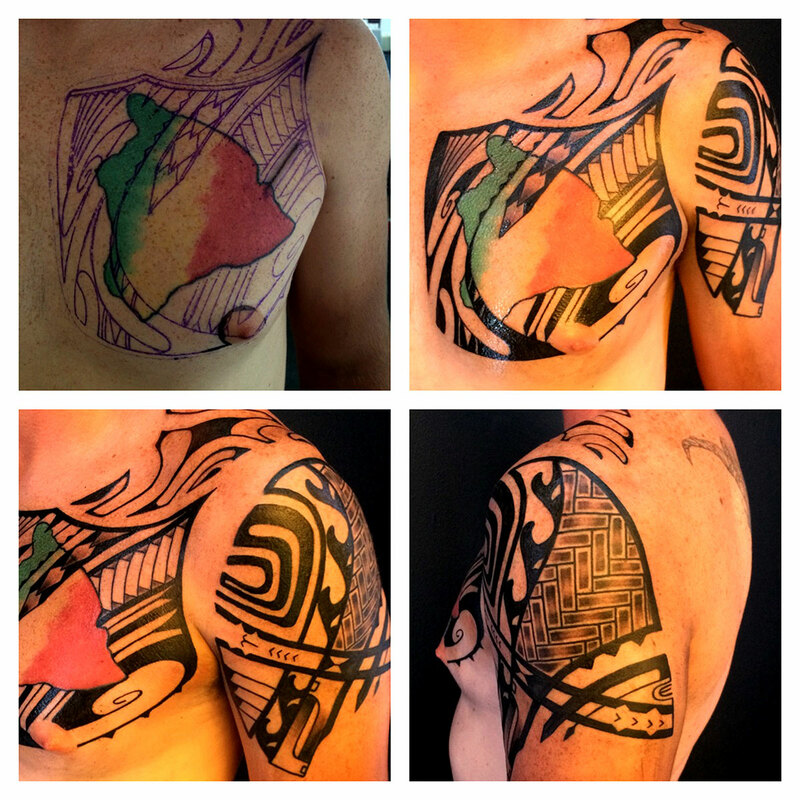 This modern Marquesan and Maori piece is an overall protective piece, but like the shoulder piece that I did a few tattoos back, is contained in the profile of a mata hoata. It speaks about the bond that he has with his daughter and the imagery used shows is meant to protect and preserve their relationship as they move forward. This piece also has a tattoo to protect the overall intent, which is a warriors head/helmet that sits above the brow of the eyes. a) siamutu – binding, using niho at the opposite ends of this paka and connecting them with a line, symbolizes his connection with his daughter. b) niho – tooth, the three niho near the ankle protects the intention of the tattoo, while the row of niho running diagonally upwards forms the mouth of the mata hoata and is meant to protect from sin and also represent family. c) ihu – nose, this is the nose of the mata hoata and symbolizes breath and life. d) mata – eye, this is the eye of the piece and is meant to look out for danger and to protect. e) tiki koa – warrior image, this image is set atop the head of the mata hoata and is a tattoo for the overall tattoo, meant to protect. f) koru – unfurling fern head, this symbolizes growth and life as she moves forward. g) ama kopeka – dancing flame, this is meant to illuminate the path forward and adds to the efficacy of the tattoo by protecting it from breaking down.